3 spray sunless sale, going on now! Get your perfect color today with our premium solution! 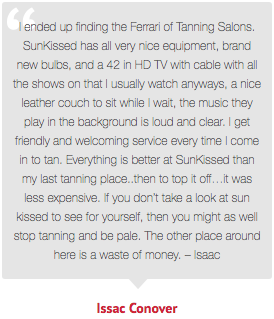 Dayton's #1 Place to Tan We want to be your partner when it comes to questions of levels or what's best for you. At our store, we offer you a great selection of high quality, products and equipment. The team at SunKissed Tanning & Beauty will spend time getting to know what's important to you so we can deliver on your tanning needs and wishes, time and again. We take pride in the relationships we build with our customers. Come see for yourself! •We offer a variety of pricing options that one can choose from! • We have sessions that don't expire for six months. Check with your salon for the specials this month. • Our most POPULAR option and the most "bang for your buck" is our Monthly Membership! • It saves you a good amount of money off of the monthly price. Members receive exclusive discounts on products and lotions, and one can upgrade cheaper than a non member. Stop in, we would be happy to further assist you! Get the BEST TAN in town! Stop in to receive the ultimate tanning experience! Proud Sponsor of The Beavercreek Beavers! Our highly trained and knowledgeable staff will be there to guide you through everything from your first base tan to the lotion that is right for you. 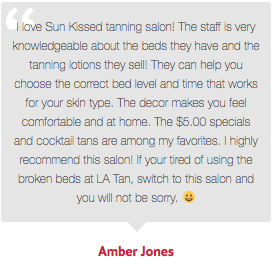 We also thrive on superior customer service and a CLEAN salon. We offer five luxurious levels of tanning at an affordable price! Come see for yourself!